To say the NES’s musical capabilities are famous is an understatement. With tunes like the Super Mario theme and the soundtracks to Mega Man 2, Castlevania, Contra, and dozens of other games, the system’s little sound chip can pump out some incredible music. The NES is practically a founding member of the chiptune musical genre, alongside such luminaries as the Commodore 64 and the Atari 800. 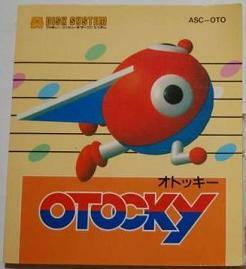 Thus when I heard about an oddball, Famicom Disk System-only ‘musical shooter’ entitled Otocky my interest was piqued. Otocky is the brainchild of Toshio Iwai, known more recently as the developer for Nintendo’s Electroplankton, and was released in 1987 by the ASCII Corporation. You play a weird little orange thing with cartoony eyes, arms, and legs that flies through inconsequential backgrounds populated with even stranger enemies. Your objective is to collect musical notes to fill a meter at the bottom of the screen, at which point the stage will end and you will face off with a giant, foe-spewing musical note. You must then fire off your collected musical notes at the holes in the boss until you’ve used them all. You can collect a bomb power-up, and your normal, boomeranging shot can be tweaked by collecting certain items. How the game plays is just a small part of the Otocky experience, though. This is a musical shooter, and is one of the first examples of synesthesia in video games. What this means is that similar to games like Rez and Space Invaders Extreme, your actions adds to the melody. Each shot you fire will change pitch depending on the direction you fire in. The sound is dependent on what “instrument” your weapon is. The simple act of collecting notes builds the melody of the level. Even the bomb acts as a drum. All the game normal provides is a simple background beat, and as you fight your way through each stage, you create your own melody. Beating a stage will let you play it in a free music mode, where you can select your own instrument and not worry about getting hurt, as exampled below. So why didn’t Otocky ever leave Japan? The game utilized the FDS’s extra sound capabilities, which the standard NES/Famicom doesn’t have. It also used a save feature at a time when cartridge games didn’t have them. The fact that the game is totally weird probably didn’t do it any favors, either. Nevertheless, the game’s musical styling is both infectious and inventive, and provides an interesting look at an early era of video game generative music. The shooter side is pretty good, too! That first song is kind of ‘power drill to the head’ annoying; but the rest of the music is appropriately adorable (especially the last song in the video). Nice find. So you’ve played this game, Kevin? I’ve played up to the end of level 3. The game gets hard! I intend to give it a good run through if I ever figure out why the erm, equipment I’m using to play the game won’t save properly.